As America battles its obesity epidemic, the health club industry is one of the primary beneficiaries. Between 2005 and 2012, U.S. fitness center numbers climbed from 26,830 to 30,500, and the trend hasn’t slowed since then, according to the International Health, Racquet, and Sportsclub Association. But that doesn’t mean everyone wants to exercise at the health club. The growing $5 billion a year exercise equipment sector is a testament to that. If you’re one of those who prefers to stay home to work up that sweat, we’ve called upon a few experts to offer suggestions when planning out that workout space, whether you’re on a shoestring budget or not. 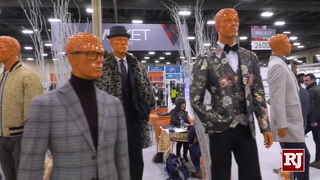 George Gonzalez, operations manager at Pacific Fitness in Summerlin, says some home fitness enthusiasts like to get the latest gadgets, sometimes splurging on items they may see on infomercials. He recommends going with tried and tested equipment instead. “I always tell people, the equipment that you gravitate to at the gym, get that instead,” Gonzalez said. The exercise equipment specialist says it’s important to buy gym-quality equipment, too. His company sells Life Fitness, Octane and DH Fitness brands. “You can go get that treadmill from Sears, and if you’re a smaller person that’s just walking, it might work, but if you’re not and you’re a runner, it won’t hold up,” he said. 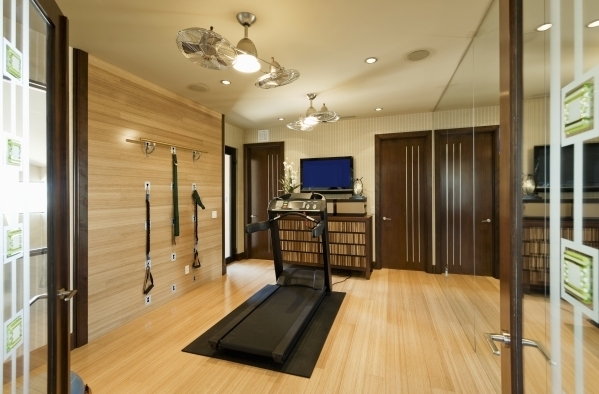 Gonzalez said, in most cases, people are converting a former bedroom into a home gym, and space is limited. He recommends getting a multi-unit cable system such as the Tuff Stuff SBT 6-pack trainer, which can cost between $2,500 and $3,000. The top-selling unit weighs about 275 pounds and is a compact system that allows for many types of resistance training exercises for the upper- and lower-body muscle groups. For the second piece of equipment, he recommends an elliptical trainer or treadmill. Ellipticals are the highest selling piece of equipment these days, Gonzalez said. Most new gym-quality ellipticals will cost $2,000 or more. Many equipment manufacturers are also incorporating technology into machines that goes far beyond simple digital screens to input resistance levels. Some equipment now allows users to control it through an iPad, iPhone or Android device, Gonzalez added. 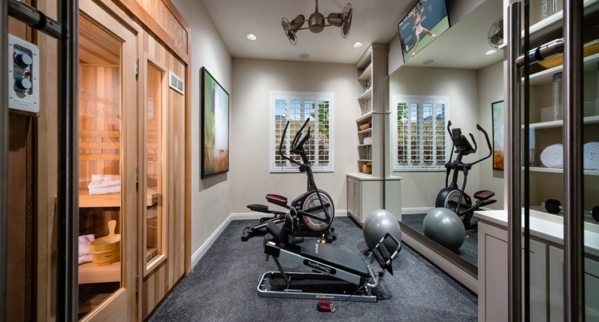 Daniel Matus, principal designer with Desired Space LLC, a Las Vegas interior design firm, has helped several of his custom home clients create home gyms. Whether you can afford a high-end space or not, he offers helpful tips for everyone. Matus tells new home clients to, first and foremost, think about the appropriate location for the gym. Avoid the second floor, if possible, especially if it’s over a guest room or bedroom. He added that if the space must be upstairs, try to locate it over a garage or patio. And with a downstairs space, keep it near the garage, he said, to get equipment in and out of the room easily. Matus also said the floor should have some level of sound absorption. Laminate floor or vinyl flooring is better than a tile or stone floor, which will likely crack or shatter in time and can also make for a noisy space. Consider adding rubber flooring, like the kind commonly seen in gyms. Most of it is very easy to install in peel-and-stick squares, he added. If tile can’t be removed from a room, Matus said rubber flooring laid over it can help to protect the tile and absorb sound, too. 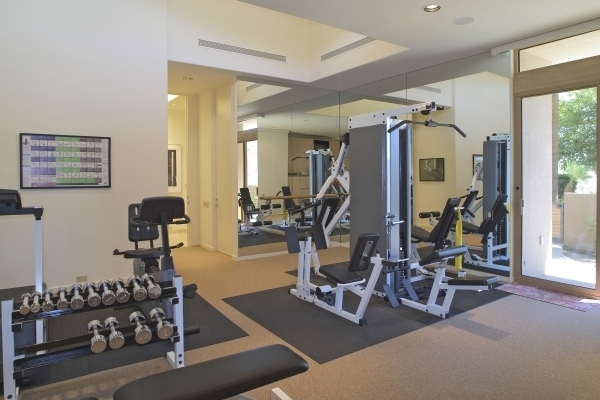 When it comes to decorating the space, Matus said large mirrors are commonly found in plenty of home gyms. “As clichÃ© as it sounds, you do see a lot of mirrors. They can help you check your form, but they also reflect light and make the room look larger,” he added. The design pro also recommends taking ventilation into account. If possible, he recommends a reverse exhaust system to draw out stale air. One can be easily mounted, if one of the room’s walls is shared with an exterior wall. If a reverse exhaust system is not in the budget, use an appropriate sized fan to keep air moving. “You really want to prevent that stale locker room smell,” he said. When it comes to wall color, the design pro leans toward bolder pallets such as blue, orange and green. Avoid beige and earth tones, as they don’t stimulate activity. “A brown or a beige will put you to sleep,” he said. Tyler Jones, principal with Blue Heron, a valley custom homebuilder, doesn’t mind pushing design barriers when it comes to just about any space in his homes. 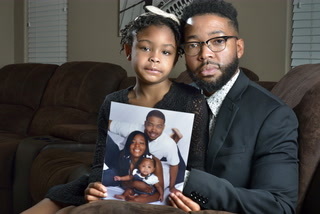 Jones’ homes often have larger gym spaces, a minimum of 15-by-15 feet, he says. While his team doesn’t order or recommend specific equipment for clients, it knows what types of equipment an owner has in mind and charts out the space’s electrical outlets and plumbing to accommodate. 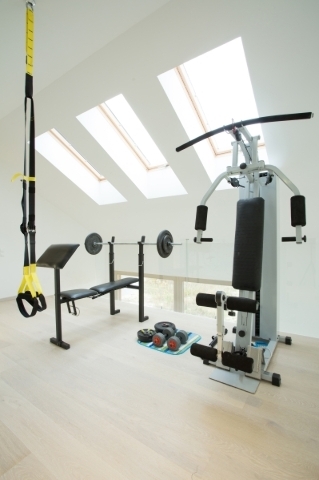 And the home gym is never too separated from the outdoors in a Blue Heron home. “For our designs, it’s a lot about how we integrate outdoor and indoor relationships. … We always want to make sure you have something amazing to look at — whether it’s an exterior space we created like a pool or a view of a golf course or the city,” he explained. Jones said putting a gym on the first floor is sound advice, but he admits to breaking that rule from time to time. “We can locate a gym anywhere. But having said that, we try to be cognizant of noise,” he added. If the space is on the second floor, special considerations for flooring and wall design are taken in order to minimize noise throughout the house. “Usually we make decisions and prioritize the space based on how much time is spent in it by the client. … Some just want a gym for resale and they may not use it as much. So we’re not going to put it in the best piece of real estate in the house. 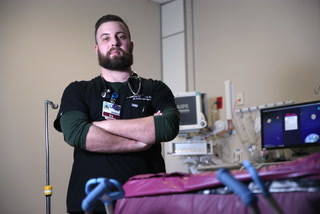 But for others who spend a couple hours a day in it, we might put it in a prime location,” he said.